Walt Disney's 1946 liveaction/animation hybrid is a strange and uncomfortable thing to behold. Long banned in the United states (though shockingly shown in theaters as late as 1986!) Song of the South is rife with racist clichés and depictions of idyllic race relations on a pre-civil war Georgian plantation. The Basic premise is a young boy (popular kid's film mainstay Bobby Driscoll) and his mother are deposited on his grandmother's planation while his father returns to a turbulent Atlanta to run a new paper. A young bare-foot african american slave about his age is then charged with tending to the boy. He then encounter's Uncle Remus a wise older man "living" on the plantation who delights the children with fanciful morality tales of Br'r Rabbit in animated cutaways. 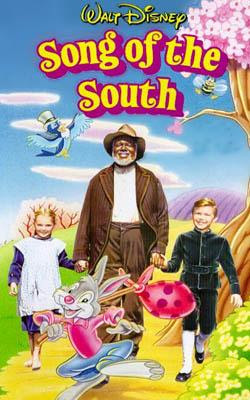 James Baskett who starred as Uncle Remus was given a special oscar- making him the first African American man to receive an Academy Award™, for a film who's premiere he was unable to attend as no hotel would rent him a room in segregated Atlanta and he would not have been permitted in the Fox Theater and after parties with the rest of the cast. The film also stars Oscar™ Winner Hattie McDaniel (Best Supporting actress and first african American to win and oscar for Gone with the Wind) as a mammy brought from the city to tend the family. The film contains shockingly inaccurate white-washed depictions of "slaves" (a word NEVER used in the film) getting up freely each morning from their cottages and merrily singing on their way to the fields in service to the plantation. All attention fall sot the care of the white child even forsaking the seeming parentless young black boy, whom is treated as a best friend and equal, but is visibly absent come the splendid birthday party scene. For some added supposedly progressive balance a single mother of a young girl and two thuggish redneck children make the counter balance of white trash vs city folk. So for historical purposes I've made the film in it's entirety available after the jump.